When it comes to Santa Claus and food, I’m not alone when I say that I only thought of him eating cookies, milk, hot chocolate and the occasional candy cane. This little idea has been perpetuated in holiday movies, like The Santa Clause, as well. But according to Santa’s North Pole Cookbook: Classic Christmas Recipes from Saint Nicholas Himself there are many more recipes, all traditional Christmas recipes from around the world, in Santa’s repertoire. The cookbook starts off with breakfast and covers breads, appetizers, side dishes, main dishes, drinks and desserts. 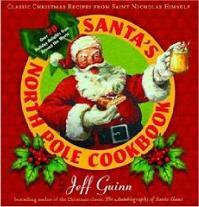 The origin country of each of the recipes is listed right in the table of contents, with some festive selections attributed to “The North Pole,” such as the Candy Cane Creme Brulee. When you turn to the main page for each of the other recipes, you’ll see a story about the origin of the recipe and the culture it comes from, as well as a discussion of why certain ingredients are used and what makes it a traditional Christmas dish. The recipes are simple and straightforward, and each is accompanied by a tip or two that should help you make them easily. The cookbook is a great holiday piece, whether it’s for a gift of you just want it to keep around the house. The recipes can be made year round, but it is obviously a great place to look for holiday inspiration and simply to read some stories of other Christmas traditions. Order The Baking Bites Cookbook now, for Christmas! Previous PostPrevious Order The Baking Bites Cookbook now, for Christmas!